Add perfect natural smell to your gifts. Breath nature. We have one-of-a-kind and surprise, surprise natural gift boxes for you folks! Do not hesitate and grab one yourself while stock lasts. It is designed for our MacBook skins to make a long-lasting impression on your loved ones. The gift box is a rich cinnamon brown color and your item is bedded on a soft natural sawdust fill. The gift box is then finished with a double bow red ribbon. The gift box is completely unbranded; therefore, you will find it useful long after Christmas to store your quirky stuff… Pictures of your happiest moments with friends… even your most important documents. If purchased with an item to go inside from WoodWe shop, delivery for the box will be free. Perfect finishing touch to a lovely gift! 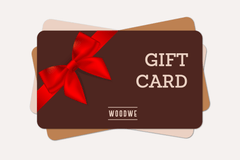 MAKE YOUR GIFT EXTRA SPECIAL – When you go gift shopping at WoodWe, you’re wrapping your loved one’s device in nature. Why not wrap the gift itself in nature too? This real wood box coyly preserves the surprise, while hinting at its truly special contents with its cinnamon brown color and big red bow. 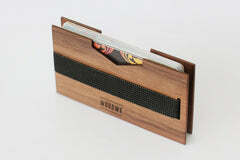 NATURAL FRAGRANCE OF REAL WOOD – Inside the wooden outer cover, your gifted item rests on a soft, natural wood fiber fill, which adds an aromatic element to the gift opening experience. Let that first gasp of delight be a breath of nature too. UNBRANDED AND REUSABLE – While we hope you’ll remember WoodWe as you continue to enjoy this reusable box, we’ve refrained from including our name on it. As well as keeping that first gift a secret, this makes the box infinitely regiftable. Pass it around your family or group of friends every Christmas, or repurpose it for year-round storage of pictures, jewelry, important documents, and other personal treasures.